Song lyrics for all of our monthly music tracks can be accessed via links at the bottom of this page. You may like to photocopy and laminate the lyrics to hand out to your residents. 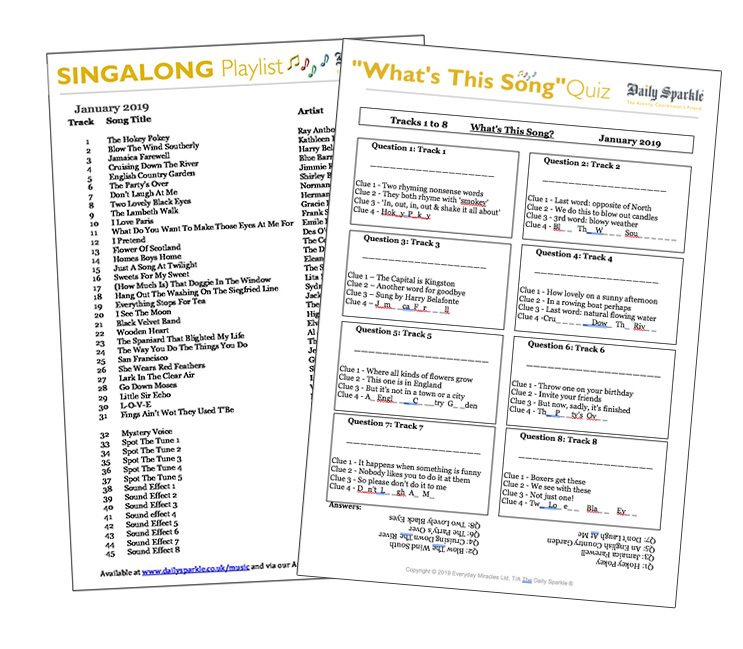 Our quizzes include a Mystery Voice or Theme Tune that your audience can try to guess, as well Spot the Tune clips, sound effect tracks and our ‘What’s This Song?’ quiz. While many of your residents will enjoy a quiz, there will also be many who just love hearing more about their favourite singers and songs. Songs and Music are fabulous for prompting reminiscence. Always be ready to take a break from any set schedule of activites to allow time for sharing of memories. Use the links provided below to access copies of lyrics, fascinating facts and playlists for recent months. You can contact us to request copies of older versions.